India Today cover story explores how a budget squeeze and policy paralysis have left India's defences exposed. It is said the more you sweat in peace, the less you bleed in war. This is a lesson India refuses to learn - sadly, most of the sweat is not out of any exertion, but frustration at the pace of modernisation and indigenisation of our armed forces. The world is moving towards third and fourth generation warfare. Third generation warfare uses speed, stealth and surprise and involves cyber warfare, airpower and networked armed forces delivering precision strikes. Fourth generation warfare is aimed against violent non-state actors like the ISIS. Yet, here we are, still struggling, confusing military modernisation with a shopping list of weapons - which we are the world’s largest importers of - waiting patiently for the Defence Research and Development Organisation (DRDO) to deliver the magic bullet. 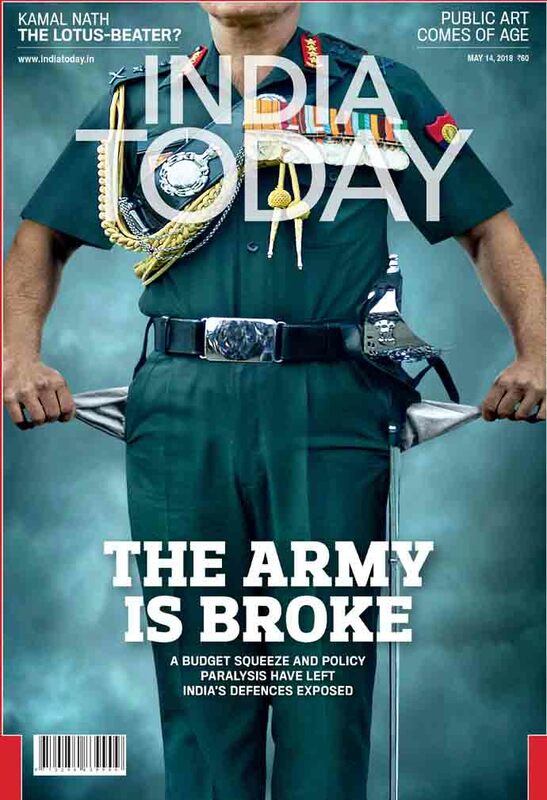 India Today cover story, The Army is Broke, for May 14, 2018. In China, meanwhile, President Xi Jinping has overseen dramatic changes in his country’s armed forces, and is turning it into the world’s fifth largest arms exporter. India, meanwhile, has failed to produce an effective rifle; locally made Arjun tanks cannot be used on the sensitive China or Pakistan borders because of performance issues; and after three decades spent developing our own light combat aircraft, India has now put out a tender for 110 warplanes. The last time the Indian Army underwent any sort of transformation was after the 2001 Parliament attacks when India updated General Sundarji’s doctrine with the Cold Start strategy that would involve limited, rapid armoured thrusts, with infantry and air support, and allow offensive operations to begin within 48 hours after orders had been issued. Despite its grand public pronouncements on national security - the BJP’s 2014 manifesto promised to "modernise the armed forces, fast track defence purchases and carry out organisational reform" - the defence ministry wallows in its bureaucratic quagmire, with four defence ministers in as many years. Although India’s defence budget has been hiked by 7.8 per cent, it is just about 1.6 per cent of the projected GDP for 2018-19, the lowest such figure since the 1962 war with China. According to experts, it needs to be over 2.5 per cent to ensure the armed forces are capable of tackling the "collusive threat" from Pakistan and China. During the Kargil war of 1999, then Army chief General VP Malik had said “we shall fight with whatever we have”. Almost 20 years later, the Army finds itself in almost the same situation with a budgetary squeeze and poor defence planning. The government has neither drawn up a national security strategy nor appointed a chief of defence staff (CDS), a single-point military advisor to the government who can foster integration of the armed forces and also allocate budgetary resources among them. In the absence of a CDS or an integrated headquarters of the armed forces, each individual service prepares to fight wars on its own and makes separate competing claims for budgetary resources. The Ministry of Defence (MoD) is an ossified structure inherited from the British. But while Britain has moved on by horizontally integrating its MoD and armed forces, India still struggles with a wasteful colonial system. Other major militaries too are reducing manpower and increasing the use of technology; only the Indian Army is adding men instead of equipment. Ironically, there is a lot of talk of nationalism, but no serious effort to resolve the mess in the MoD. The Make in India campaign for defence, which held great promise, is a failure. DRDO and ordnance factories are a millstone around the necks of the defence establishment. We are the largest importers of defence equipment in spite of this large government-owned military-industrial complex. The procedures are so convoluted that decisions are not made or are delayed so that equipment is obsolete. The Modi government may have removed corruption in defence purchases, but the paralysis remains. Our armed forces are a great institution with fine traditions. They need to be equipped for modern warfare with new and innovative thinking. Their courage can never be doubted; they need to be looked after.